Looking for a Tropical Getaway where you can discover true underwater beauty? Well it's not so far away, it's in St. Lucia - Maybe the world's last unexploited diving location. It is all about family and Diving Holidays in Saint Lucia. 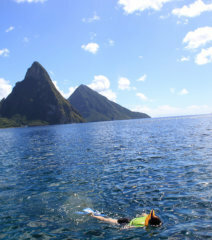 With our St Lucia Diving Packages you can also experience St Lucia snorkeling, coastal and river kayaking and hiking. It's A World of Adventure! 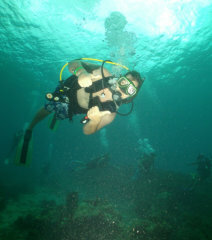 Start Experiencing Diving and Snorkeling in St Lucia Today. Our Scuba Diving Tours will take you to rich, diverse natural and artificial reefs, discover Shipwrecks, Wall dive off the majestic Pitons in Soufriere, night dive among sleeping sting rays. Enjoy this natural island beauty with your Scuba Vacation by visiting Anse Chastanet, Anse Cochon and many more prime sites. You can also choose from our Diving in St Lucia Resort partners for your hotel dive package. St. Lucia snorkeling is among the finest in the region. Because the island is volcanic in nature there are spectacular coral reefs, trenches, caverns and walls all nestled with an array of Caribbean reef fish. Go Diving - Get PADI Certified - Whether you're seeking to experience your first breath underwater in the Open Water Diver course or the next specialty course you'll find the perfect course right here. 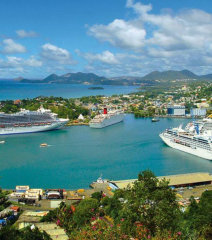 With this special, cruise ship vacationers get the opportunity to explore the ultimate underwater beauty of St. Lucia. If your cruise ship is docking on this island, then we can provide your Shore Excursions. Immerse yourself in St. Lucia’s culture and history with a sea and land tour to Soufriere. Witness the natural beauty of the Caribbean coast from the sea, two great tours in one. Sail along the coast, relax before stopping for an exciting snorkel or scuba dive tour at one of our prime sites. Dive Fair Helen is a PADI Resort Dive Center and DAN Business Member, owned and operated by a St. Lucian environmentalist with over 20 years experience in marine research in St. Lucia. We at Dive Fair Helen are extremely proud of our island (St. Lucia) especially our marine resource and place great emphasis on education and safety. The pride of our operation is our two custom built dive boats both with on-board wash room and shower facilities, plenty of shade and ease of entry and exit, "You will enjoy the personal touch with your St Lucia diving vacation package".